As many of you may know, Ruby asked Santa for a big-girl bed for Christmas. Well, Santa delivered. Not only that, but she got new bookshelves from Ikea, as well as a 32-inch LED LCD TV. Lucky duck! 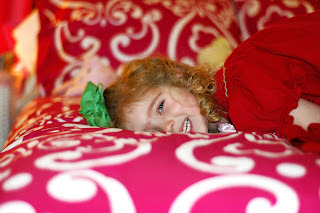 Here are the before pictures of her cluttered nursery. It's organized chaos. Don't judge, ok? The Ikea instructions were very clear that if you assembled these alone, you would end up sad and confused. If you had a partner, you would be happy and successful. So (of course) I decided to do this all by myself, while drinking a glass of wine. This should go well, right??? Aaaaaand the glorious AFTER picture! Watch out, HGTV. I'm coming for ya! She loooooves it, by the way.